Despite having spent millions on repealing broadband privacy and soon net neutrality, Comcast's lobbyists and PR folks have spent the last few weeks claiming that nobody has anything to worry about because Comcast would never do anything to harm consumers or competitors. This glorified pinky swear is likely going to be cold comfort for the millions of consumers, small businesses, startups, and entrepreneurs trying to build something (or god forbid directly compete with Comcast NBC Universal) over the next decade. But while Comcast is busy trying to convince everyone that gutting regulatory oversight over an uncompetitive broadband market will only result in wonderful things, they're simultaneously back peddling on past claims to not violate net neutrality. Earlier this week, Ars Technica penned an article discussing how Comcast's past promises to not engage in "paid prioritization" have magically disappeared. Paid prioritization is the act of letting one company (say, Comcast-owned NBC) buy a faster, lower-latency pipe than its competitors. Obviously, such a scenario creates a market whereby deep-pocketed companies can pay for an unfair advantage over startups, non-profits, or smaller companies. That's not to be confused with enterprise prioritization or the prioritization of medical services, though that's a conflation Comcast lobbyists really enjoy making. Back in 2014 when the debate was at its peak regarding the creation of the 2015 rules, Comcast repeatedly promised that paid prioritization would never be something it engaged in. Ars does a solid job highlighting how this promise has all-but disappeared from Comcast and Comcast-backed NCTA lobbying and policy materials over the last few years. 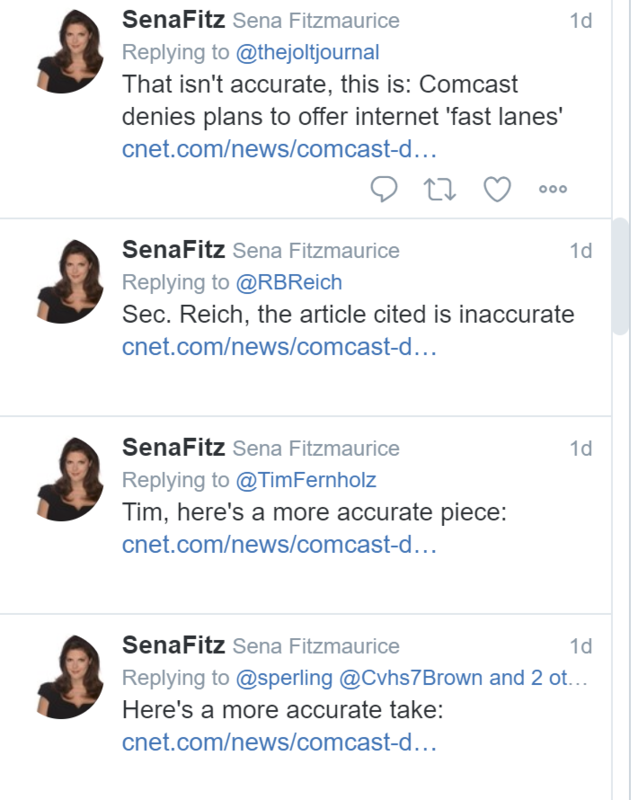 This apparently angered Comcast PR rep Sena Fitzmaurice, who has previously and repeatedly yelled at me for calling Comcast's top lobbyist a lobbyist (you're supposed to call him Comcast's "Chief Diversity Officer" to help him tap dance around lobbying disclosure rules). 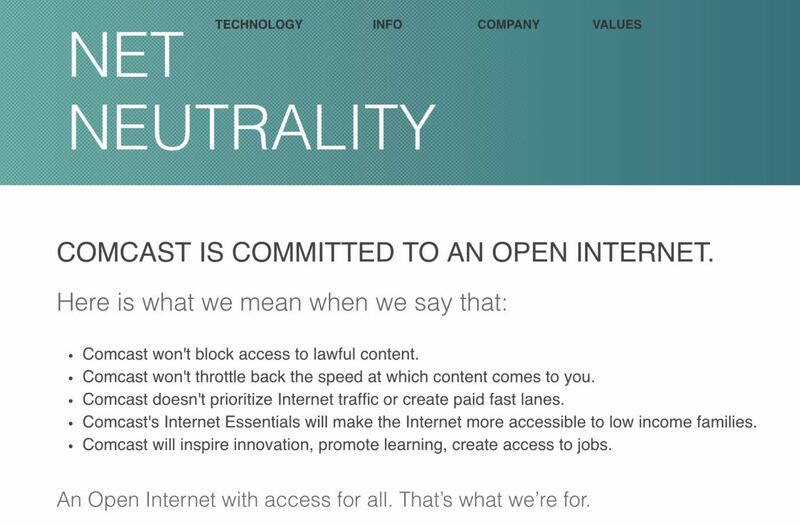 "Starting in 2014, (Comcast's website) contained this statement: "Comcast doesn't prioritize Internet traffic or create paid fast lanes." That statement remained on the page until April 26 of this year, according to page captures from the Internet Archive's WayBack Machine. But on April 27, the paid prioritization pledge was nowhere to be found on that page and remains absent now. What changed? It was on April 26 that FCC Chairman Ajit Pai announced the first version of his plan to eliminate net neutrality rules. Since then, Pai has finalized his repeal plan, and the FCC will vote to drop the rules on December 14. You'll note, perhaps, that Comcast's promises get shorter and shorter the closer it gets to achieving its goal of fewer consumer protections. Oddly, Fitzmaurice has yet to complain about the updated version of the Ars story. Comcast's track record on this sort of thing isn't particularly hot. You'll recall Comcast helped send the net neutrality debate into overdrive when it was caught throttling all upstream BitTorrent traffic without telling anybody, then lied that it was doing so until the Associated Press proved it. In the years since Comcast has gotten much more creative in abusing a lack of competition in the sector, whether that's by imposing unnecessary usage caps that only its own content is exempt from, blocking competing hardware and services for no good reason, or interconnection shenanigans. The idea that Comcast will take full advantage of the one two-punch of limited competition and apathetic regulators is all but a certainty according to history. 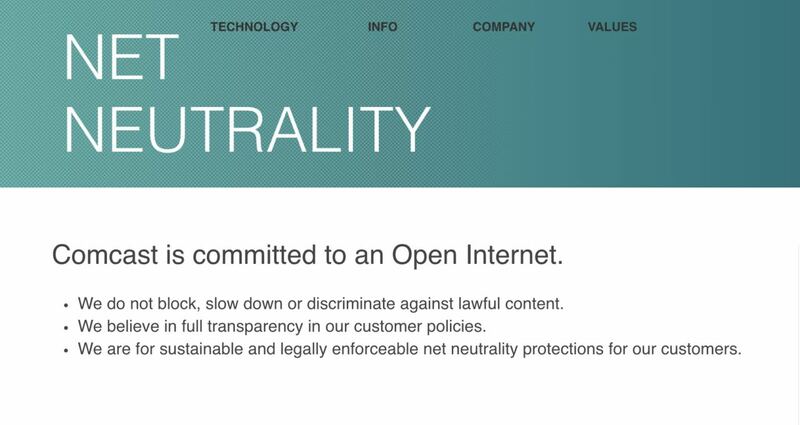 It's likely that for a year or two after repeal, Comcast and other ISPs will avoid getting too heavy handed in the hopes of convincing folks that net neutrality worries were over-stated. After that, you can be fairly certain that Comcast will slowly but surely engage in tricks old and new to leverage a lack of competition to its full, tactical advantage. You can also be fairly certain that while this is happening, you'll be told you're most definitely hallucinating the entire affair. "Hey, Karl Bode, that's a nice [____] you got there. It would be a shame if anything happened to it..."
Don't laugh, big corporations have been known to engage in some very dirty (including outright illegal) tactics against critics (Just ask Ralph Nader) but most of the time the public never learns about it, because the hired thugs successfully pulled it off, and yet another critic is permanently silenced.